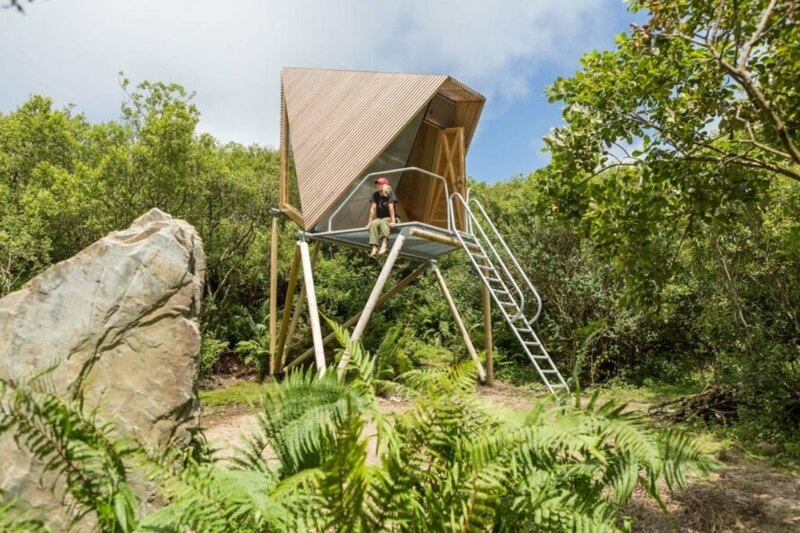 Architectural firm New British Design has unveiled four tiny cabin retreats located in Britain’s North Cornwall coast. The Kudhva Wilderness Cabins are compact, angular huts elevated off the landscape by turned pine poles, providing stunning views of the surrounding wilderness. 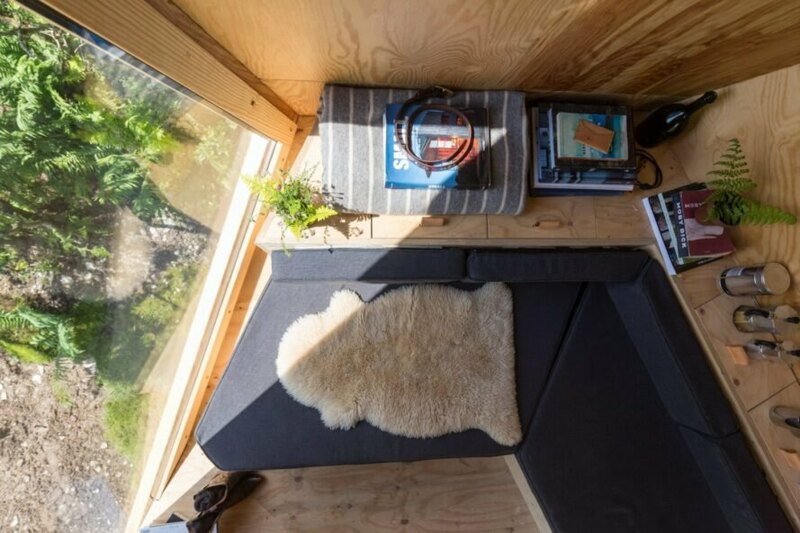 Inside, the compact spaces offer guests all the basics needed for a truly off-grid getaway. 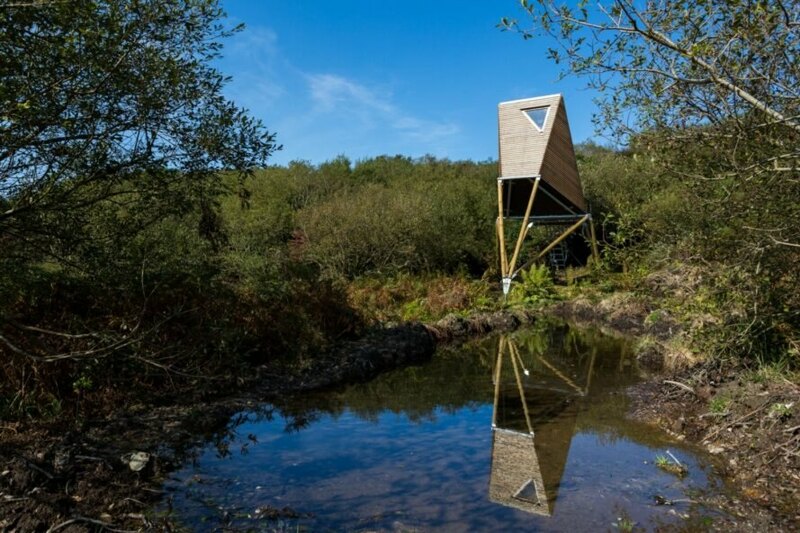 Located in an old slate quarry that has been overrun by lush natural greenery, the huts are a project between New British Design founder Bill Huggins and long-term collaborator Louise Middleton. 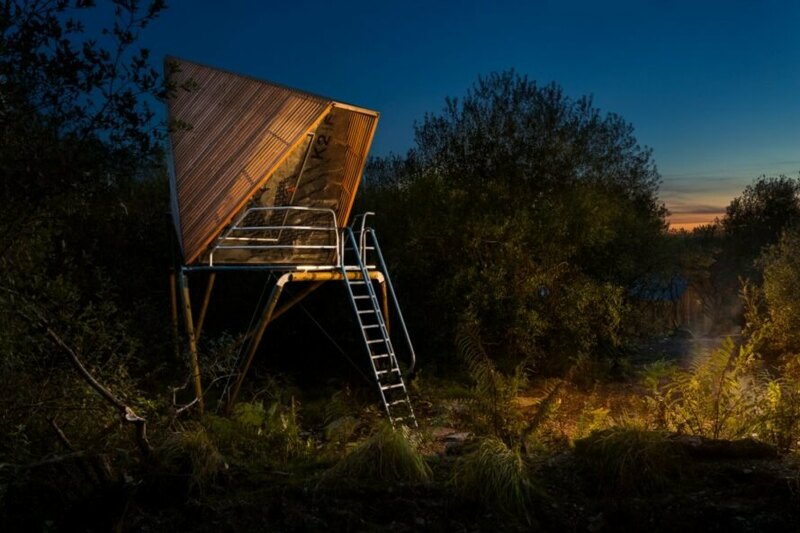 Working with boat-builder-turned-furniture-maker Toby Sharp, the designers created the tiny cabins to be the ultimate retreats for travelers to the North Cornwall coast. Although the region is a popular destination for tourists looking to explorer the expansive coastline, this specific area is extremely remote and, as such, is a perfect place to completely disconnect. The word “Kudhva” comes from the Cornish word for “hideout,” which was the driving factor behind the cabin design. Elevated high up into the tree canopy by a series of cylindrical pine columns, the secluded retreats let visitors enjoy incredible views of the surrounding wilderness and local wildlife. Working directly with the architects, Toby Sharp designed and built the timber cabins with a small team of master craftsmen in a local workshop. This system allowed the construction process to reduce the project’s environmental impact. Once fully constructed, the cabins were then transported to the site and carefully placed onto their cradle bases by crane. Made out of insulated, paged-pine panels with an EDPM rubber membrane covering, the cabins are clad in a series of larch slats. 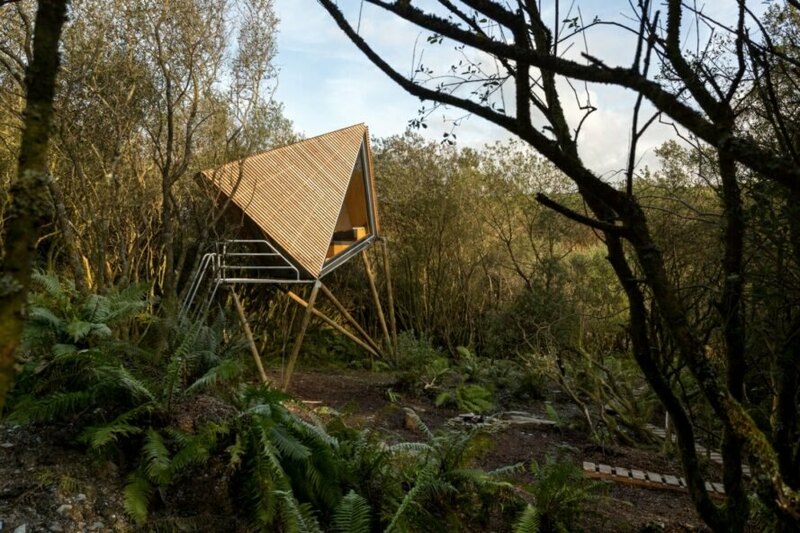 The natural exteriors, along with sharp, angular lines, seamlessly blend the cabins into the forestscape. Accessed through a ladder, the interiors feature an open layout with enough space for a sofa, a sleeping loft and a wood-burning stove. Various triangular windows and glazed facades look out over the surroundings, further embedding the rustic retreats into the tranquil landscape. 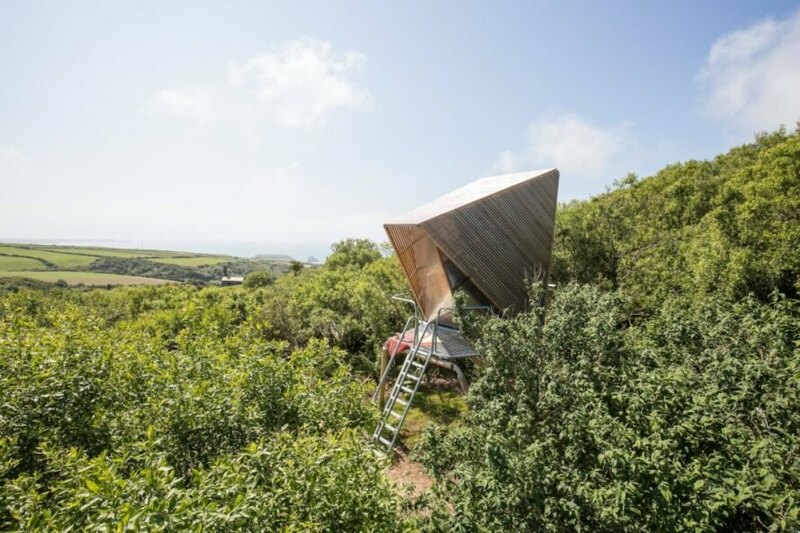 Architectural firm New British Design has unveiled four tiny cabin retreats located in Britain’s North Cornwall coast. The four cabins are located in a remote area along the coast. The cabins are reached by ladders. The dwellings are located in an old slate quarry that has been overgrown with lush greenery. Timber poles elevate the cabins off of the landscape. The interior of the cabins are quite compact. With a small living space and sleeping loft, the cabins offer just the basics. 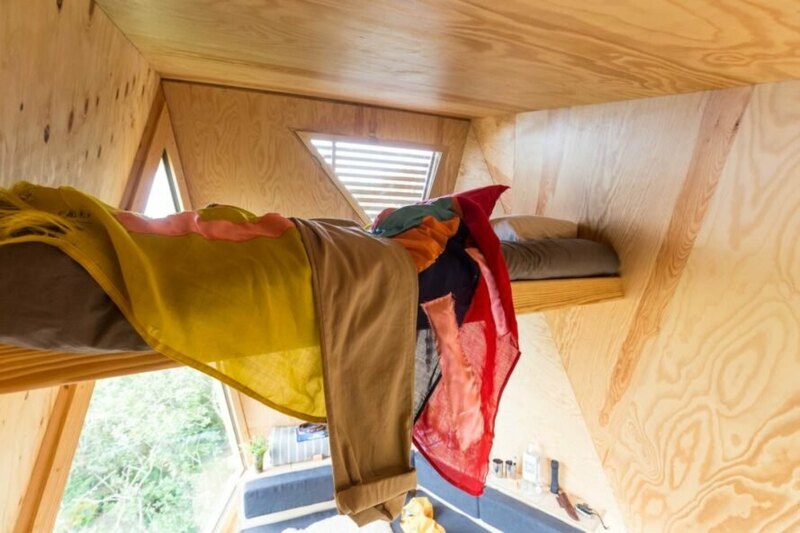 A sleeping loft is located over the living room. 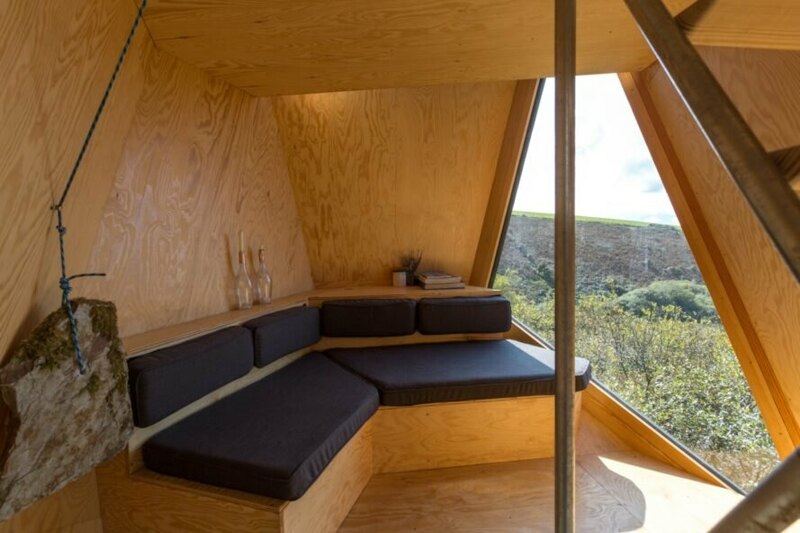 Triangular windows offer natural light and stunning views. Each cabin features a glazed wall to connect the cabins to their surroundings. A small deck lets guests enjoy the fresh air and beautiful surroundings. The angular cabins are covered in larch paneling. The cabins were designed to be off-grid retreats.